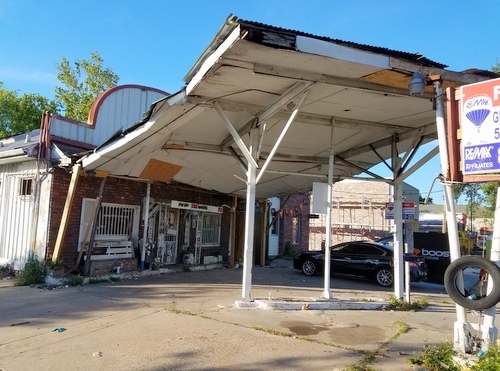 A former South Carrollton Avenue service station with a long distinctive overhang was approved for demolition this week, and the new owners plan to replace it with either a sports bar or a drive-through coffee shop. The building at 3200 South Carrollton Avenue (at the corner of Oleander Street about a block off Earhart Boulevard) was owned by the Patterson family since the 1970s until it was sold to Evelyn Evans Freiberg for $200,000 in early March, according to documents included with the demolition application. Evelyn Freiberg said the coffee chain would also use a drive through at the location if that project comes to fruition. City records, however, show the location has submitted a request for a neighborhood meeting about a sports bar. The old gas tanks remain in the ground but have been filled with concrete, and the demolition process will remove them, said Evelyn Freiberg. No benzene has been found in the soil, but Demo Diva will test the soil after the removal, and if any chemicals leaked, they will replace the affected soil and three feet around it, Evelyn Freiberg said. The surface level is actually lower than the street, so part of the property also needs to be elevated, John Freiberg said. The demolition request received a unanimous vote from the committee, though it does not specify any particular use for the property. The committee’s recommendation will next be forwarded to the City Council for final approval. I’m with Lee Bressler — coffee shop. Does the rinky dink building next door go too? How did it ever get built? Danae Columbus: Derrick Edwards joins crowded race for state treasurer Danae Columbus: Is Frank Scurlock the “Gorilla Man” of the mayor’s race?